A young student working on a handwriting robot, cryptocurrency and digital cooperatives. Say Hi to Zvezdin Besarabov. Zvezdin Besarabov is an accomplished student from the National High School of Mathematics and Science in Sofia. As a member of the Obecto cooperative, he is the main driving force behind one of our most ambitious and exciting undertakings yet. 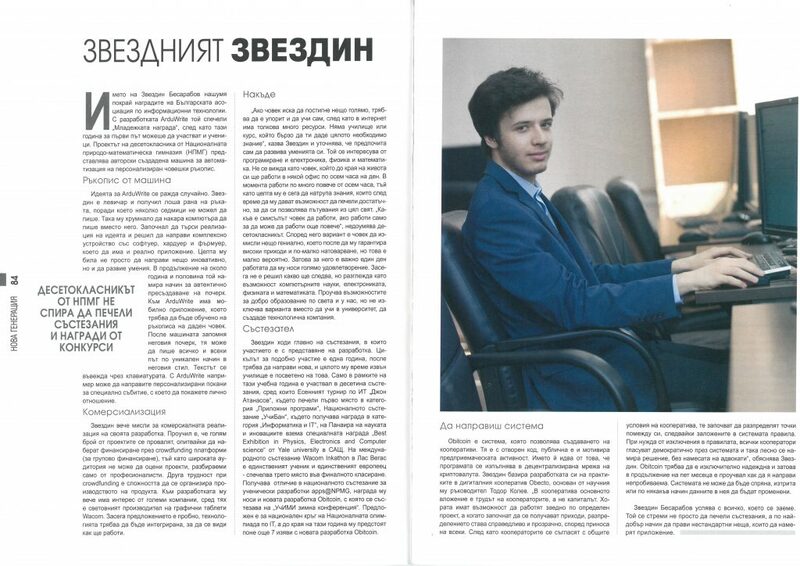 We are very proud that the latest issue of the Economy magazine dedicated a whole article about Zvezdin. Below is a translation of that article, introducing his latest invention, numerous achievements, and his latest project. The Obecto team would like to take this occasion to thank Zvezdin, for his dedication and hard work and wish him many, many more proud occasions. Best of luck Zvezdin! The name of Zvezdin Besarabov became famous during the Bulgarian Association of Information Technologies awards. This was the first year in which students could participate and he won the “Youth Award” by developing ArduWrite. The project of the tenth-grader at the National High School of Mathematics and Science is a machine he developed himself for automating human handwriting. The idea for ArduWrite was born by chance. Zvezdin is a left-hander and he hurt bad his hand which did not allow him to write for several weeks. This is how he came up with the idea to make the computer write instead of him. He started looking for ways to realize his idea and decided to create a complex device with software, hardware, and firmware which would also have a real-life implementation. His goal was to not only create something innovative but to develop new skills as well. For a year and a half, he was looking for ways to recreate an authentic handwriting. ArduWrite is connected to a mobile application which should be taught the handwriting of a particular person. Afterward, the machine memorizes this handwriting; it is able to write everything in a unique way in the user’s style. The text is being entered by a keyboard. For instance, with ArduWrite you can create personalized invitations for a special occasion and thereby add a personal touch. Zvezdin is already thinking about the commercial realization of his device. He found out that many projects fail, trying to raise funding through the crowdfunding platforms since the wide audience cannot evaluate projects which are comprehensive only to professionals. Another obstacle of the crowdfunding is the difficulty in organizing the product development. Zvezdin has already received interest for the production by several big companies, among which the global graphics tablets manufacturer Wacom. For now, it is a trial offer since the technology should be integrated first in order to observe how it would work. “If a person wants to achieve something big, he should be persistent and learn on his own since there are so many resources online. There is no school or course which will quickly give you all of the necessary knowledge,” says Zvezdin and adds that he prefers to develop his skills on his own. He is interested in programming and electronics, physics and mathematics. He cannot see himself working in an office for 8 hours a day for the rest of his life. Currently, he is working way more than 8 hours a day because he wants to accumulate knowledge that will earn him enough money to travel the whole world. “What is the purpose of a person working only for the sake of working even more,” wonders the tenth-grader. According to him, it is possible for a person to invent something genius which in turn will secure his high income and more free time; however, this is very unlikely. That is why for him, it is important that his work brings him great satisfaction. He hasn’t decided what to study yet, but he is considering computer sciences, electronics, physics, and mathematics. He is researching the options for a good education in Bulgaria and abroad; however, he is not excluding the option to create a technology company instead of going to a university. Zvezdin participates mainly in competitions which require presenting a developed product. The cycle for such participation is one year, after which he starts working on a new creation and all of his time outside of school is committed to this. 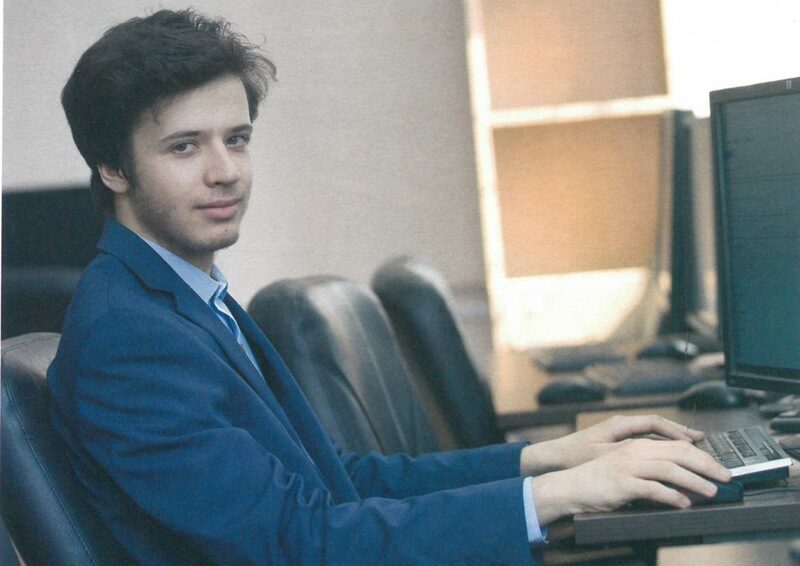 During this school year he has participated in about 10 competitions, among which the Јohn Atanaѕoff National Autumn Tournament in Informatics, winning first prize in the “Applied programs” category, the national competition UchiBan, winning a prize in the “Informatics and IT” category, in the Science and Innovation Fair at the Yale university in the USA, winning the special prize “Best Exhibition in Physics, Electronics, and Computer Science”. He is the only student and European to participate in the international competition Wacom Inkathon in Las Vegas and where he won third prize. He received a prize in the national competition for student projects – [email protected] He also received an award for his new development Obitcoin, with which he participated in the Winter Conference for Mathematics and Informatics for students. He was suggested for the national round of the National IT Olympics and furthermore, until the end of this year, he will have at least 7 participations with his new project, Obitcoin creation. Obitcoin is a system which allows creating a cooperative. It is open source to the general public and stimulates the entrepreneurship activity. The name comes from the fact that the program is executed in a cryptocurrency decentralized network. Zvezdin based his project on the practices implemented in the digital cooperative Obecto, founded by his supervisor Todor Kolev. “The main asset of a cooperative is the labor of the people in it and not the capital. People have the chance to work together on a particular project; when money starts to flow in, the distribution is conducted fairly and transparently according to everyone’s contribution. After the cooperators agree with the common conditions of the cooperative, they start distributing points among themselves, following the system’s rules. If there is to be an exception to those rules, all cooperators vote democratically through the system and find a solution easily without lawyers,” explains Zvezdin. Obitcoin should be extremely reliable and this is why he spent five months researching how to do it impenetrable. The system cannot be stopped, deleted and also the data inside cannot be changed. Zvezdin Besarabov is succeeding in everything he does. He does not just strive to win competitions but to do unusual things in the best way possible so that they can be implemented.